Here’s another brown for you guys today. 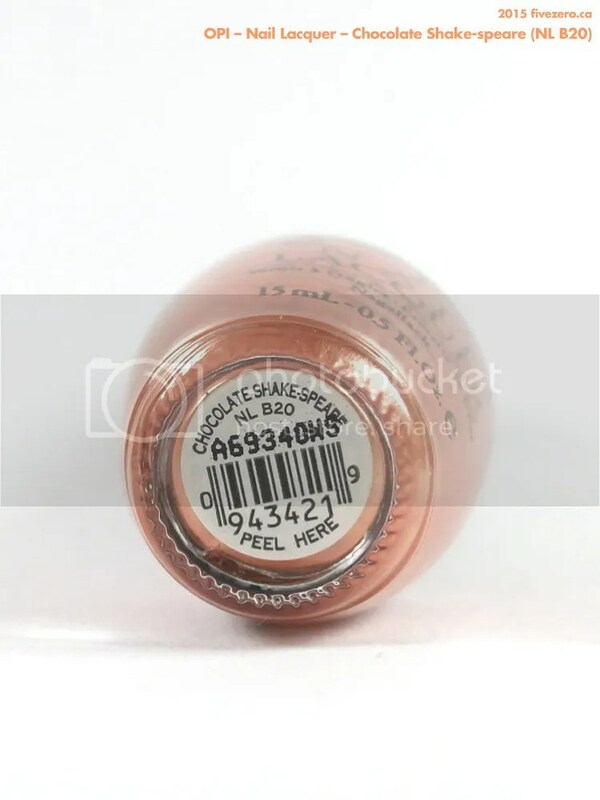 It’s Chocolate Shake-speare (NL B20) from OPI’s 2003 British collection. It’s a pinkish-beige shimmer, but there’s so much more to it than that! Chocolate Shake-speare has fine peachy-gold shimmer, giving it a subtle, pearly finish, but the beige itself has a slight pink-mauve tone to it. It will tend to lean a little warm or cool depending on what tones your skin brings out. It is definitely reminiscent of a chocolate milkshake! It pulls warm and golden on me thanks to my summer tan on yellow-toned skin. I find my old OPIs have held up brilliantly. Chocolate Shake-speare’s is still good with two coats. 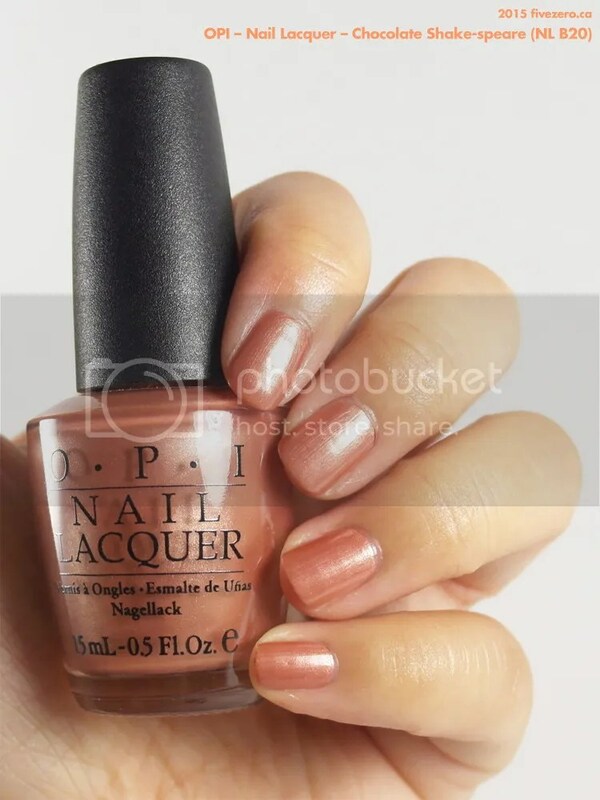 OPI Nail Lacquer retails for about US$9.50 / higher in CA$ (I see a range of prices) and is 0.5 US fl oz / 15 mL. OPI nail polishes are currently free of toluene, formaldehyde, dibutyl phthalate (DBP) and camphor. (Since this is an older polish, this is not 3-Free.) They are made in the USA. I was surprised about the chocolate shake part that I thought it would called rose gold or something along those lines instead! What a beautiful every day-color! Yes, it is perfect for everyday wear, even in most conservative settings! Oh I like this even with the frost. It doesn’t look like it shows much in the way of brush strokes. Yeah, this is pretty much as close to frost as I will usually like!